It was for the first time that Google Glasses have been shown in Europe. 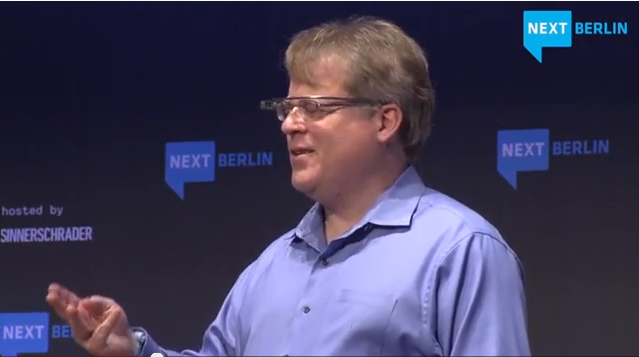 Robert Scoble wore his newest gadget when he entered the stage at NEXT Berlin 2013. A true NEXT moment happened when he let Bruce Sterling try out Google Glasses. Robert Scoble: >> We are in competition with each other for all sorts of things. For instance, I was on a plane one day and I didn’t turn off my cellphone cause I’m a bad boy. And i have trippit on my phone. And trippit told me “your plane is canceled and it is going back to the gate”. I immediately bought a ticket on another airline out of town – there were 3 tickets for a hundred people.